Raise your glasses! 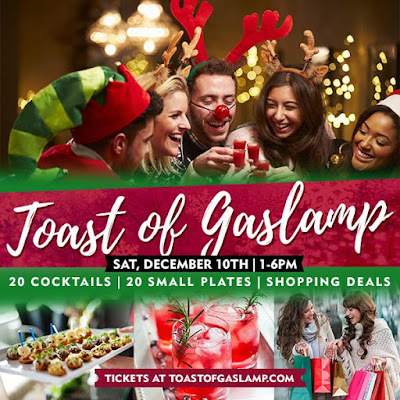 It’s time to salute the holidays with the 3rd annual Toast Of Gaslamp on Saturday, December 10, from 1-6pm. Twenty of the top restaurants in San Diego's Gaslamp Quarter will be shaking up delicious cocktail samples and dishing out scrumptious bites during this self-guided tasting walk, all while area retailers presenting shopping deals so that participants can load up on holiday gifts. Because we are filled with holiday cheer, we are raffling off 2 passes to this festive event, as well as offering promo code SDVILLE for $5 savings per ticket! At the Toast Of Gaslamp, enjoy the opportunity to sample some of the most satisfying sips and appetizing nibbles that the Gaslamp Quarter has to offer, and shopping along the way! Don your festive attire, round up your friends, and enjoy an event that has become a holiday tradition for many San Diegans. Believe us, Yule have a blast! Participating restaurants serving up sample size portions of their favorite cocktails and dishes include 1919, Bandar, BIGA, Blue Point Coastal Cuisine, Bravo Carne Asada, Carne Prima, Coyote Ugly Saloon, Don Chido, Gourmet India, Henry's Pub, Ida Bailey's Restaurant, Le Parfait Paris, Lotus Thai Cuisine, Maryjane's at The Hard Rock Hotel, McFadden's, Rockin Baja Lobster, Rustic Root, The Field Irish Pub, Tilted Kilt, Tin Roof, and Whiskey Girl. Participating retailers offering special savings are Blue Jeans and Bikinis, Bubbles Boutique, Eyes on Fifth, Reebok Fit Hub, San Diego Trading Company and more. Purchase your tickets online for only $25 in advance or $30 on the day of the event. Be sure to enter promo code SDVILLE at checkout to save $5 per ticket. Mingle with friends, family, and fellow San Diegan’s as you toast your way through the historic Gaslamp Quarter. Step away from the hustle and bustle of the Holidays to enjoy a much needed, and well deserved, afternoon of sipping, savoring, and shopping, all while soaking up the season. Toast of Gaslamp is the perfect way to spend an afternoon festively feasting and shopping as you stroll your way through 20 of the most delicious Gaslamp restaurants/and retailers. For more information on the Toast Of Gaslamp and to purchase tickets, visit ticketsauce.com/e/toast-of-gaslamp.